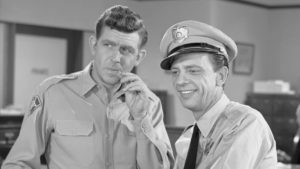 "Andy Taylor and Barney Fife Become Criminals"
One day Barney Fife was practicing his quick draw. He accidentally shot Thelma Lou, he broke the law. Andy had no choice but to put Barney in jail. But Andy let Barney out when he said he had a crop of marijuana to sell. Barney offered Andy a fifty-fifty deal. But Andy wanted it all, he decided to steal. He shot poor Barney and dumped his body in Myers Lake. Andy became furious when he learned the marijuana was fake. The crop of marijuana turned out to be oregano. Andy was arrested and jail was where he had to go. Andy will be pounding rocks for the rest of his days. The Sheriff soon learned that crime doesn’t pay. "I think you’re pretty, beautiful"
"Getzumia: Island of the Past Warriors"